Background: Microflora of the gastrointestinal tract plays important roles in food digestion, nutrient absorption and in host defense against ingested pathogens. Several studies have focused on the microflora of farmed fishes, but the gut flora of wild fishes remains poorly characterized. The aim of this work was to provide an overview of the bacteria colonizing the gut of wild-caught fishes and to determine whether some bacterial species can be pathogenic. Results: We isolated cultivable bacteria from fifteen wild-caught Mediterranean fish species corresponding to different habitat, diet and origin. Bacterial species identity was determined by 16s rRNA gene sequencing for the 61 isolates. The potential pathogenicity of isolated bacteria was investigated using fruit fly (Drosophila melanogaster) and zebrafish (Danio rerio) as model organisms. Two bacterial strains (Serratia sp. 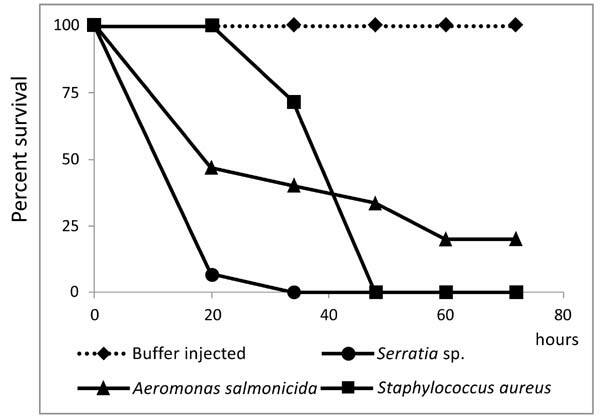 and Aeromonas salmonicida) were lethal when microinjected to Drosophila, while zebrafish did not develop any disease when exposed to any of 34 isolated bacterial strains. However, it was interesting to note that two bacterial strains (Shewanella and Arthrobacter) isolated from marine fishes were able to colonize the guts of freshwater zebrafish. Conclusion: The results of this study give an overview of the bacterial species found in the guts of wild fishes living off Beirut seashore. It shows that some parameters believed to be limiting factors to host-gut colonization by bacteria can be overcome by some species. This pilot study could be extended by sampling a larger number of fish species with several specimens per fish species, and by identifying uncultivable bacteria that reside in the fish guts. Our results may have implications for the utilization of certain bacterial species in fish farming or their use as bio-indicators for water and/or food quality. Keywords: Bacteria, Drosophila, gut flora, infection, mediterranean fish, zebrafish. Keywords:Bacteria, Drosophila, gut flora, infection, mediterranean fish, zebrafish. Abstract:Background: Microflora of the gastrointestinal tract plays important roles in food digestion, nutrient absorption and in host defense against ingested pathogens. Several studies have focused on the microflora of farmed fishes, but the gut flora of wild fishes remains poorly characterized. The aim of this work was to provide an overview of the bacteria colonizing the gut of wild-caught fishes and to determine whether some bacterial species can be pathogenic.